Thirty years ago, mathematical computation was difficult to perform and thus used sparingly. However, mathematical computation has become far more accessible due to the emergence of the personal computer, the discovery of fiber-optics and the consequent development of the modern internet, and the creation of Maple, Mathematica, and Matlab. 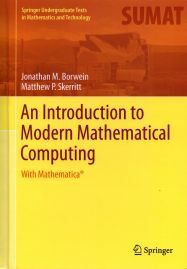 An Introduction to Modern Mathematical Computing: With Mathematica looks beyond teaching the syntax and semantics of Mathematica and similar programs, and focuses on why they are necessary tools for anyone who engages in mathematics. It is an essential read for mathematicians, mathematics educators, computer scientists, engineers, scientists, and anyone who wishes to expand their knowledge of mathematics. This volume will also explain how to become an �experimental mathematician,� and will supply useful information about how to create better proofs.